50 credits are 79.95 AUD. 100 credits are 154,95 AUD. * The credits enable you to send messages. Inbox: Where you can read emails and send emails to people on the site. Matches: See matches on this page. Search: Search for people based on whatever search criteria you have. Favorites: You can add women that you're interested on your favorites page. Hot Or Not: Rate photos from other members and give a hot or not approval. 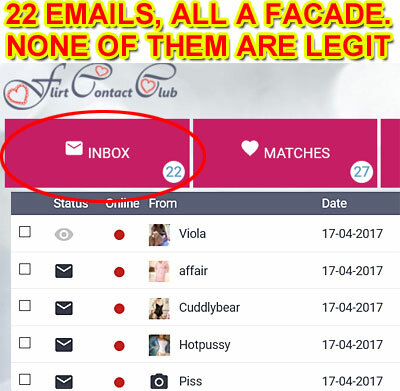 Today we investigate FlirtContactClub.com to see if it's a real hook-up site to meet legitimate women or if it's a fraudulent website build to appear to be legitimate. We did some quick investigating and we've already noticed that Flirt Contact Club is associated with numerous dating sites a few of which we have reviewed in the past. The list of sites includes 40PlusContact.com, FlirtMature.com, SecretFlirtContact.com, MySecretMatureContact.com, and ContactMature.com. Right off the bat this website has one strike against it because all these sites are been proven to be using false profile pages. To read the rest of this review please scroll down. The quickest way for us to identify if a website is illegitimate is when you start getting instant messages and emails right after joining the site. And guess what? That's exactly what happened in the case of Flirt Contact Club. As of writing this review we've already received 22 email messages from all types of women. You can take a look at the evidence below, a screenshot showing 22 emails that we received. It's a huge sign that the site isn't legitimate. y real datign serviceAny legit dating services that we reviewed in the past we never received emails from local women (especially in such a short time span). On any real dating service in order for a male member to get any response you would have to contact and email lots of girls (maybe 100) to get at least one response back. It's not always that way but the men are the pursuers and the women are the ones who get pursued. On phony dating sites the women are the one pursuing the men. Why? It's because the girls aren't legitimate members. These are not real women sending us real email messages. As crazy as this may sound to novice users of dating services many phony dating sites used computer software programs called bots. A bot is a software application that is used by fraudulent dating services to automate email messages. These phony dating services send fictitious email messages using computer software to automate the process. Unfortunately the emails look legitimate, it looks as if a real female has written and email and sent them to you. Take note that this isn't actually what is going on. You are receiving emails from a robot and not a real local girl looking to hook up with you. Receiving 22 emails in a very short time frame is a very strong indicator of what this website is all about. These messages are used to entice and lure members (like fish get lured to bait on a hook) to upgrade so they can send and reply to emails from the bots. Of course the people upgraded have no clue that the email messages are sent from an automated bot and not a real girl. All of this is a provable fact if you read the terms and conditions of FlirtContactclub where they outline and detail that they do use automated software programs! Simulated consumer profiles, what exactly does that mean? According to the own terms and conditions page simulated consumer profiles are self-created profiles designed and used by the site. Flirt Contact Club makes their own profile pages! These are fictitious profiles created and managed by the administrators of the site. You can never meet the people behind these profiles in a real life situation because they aren't real legitimate members of this website. The only reason these profiles are used is to give the appearance of a site full of horny local women looking to get laid. In reality all these profiles are completely fictitious and used as a marketing scheme to get you to upgrade and purchase a membership on there fictitious dating service. Looking at any profile on FlirtContactClub.com you wouldn't be able to identify what profiles are truthful and which ones are completely faked. The made-up profiles look real, you cannot tell the difference. They have everything you would see in a legitimate profile including the gender, age, province, education, appearance etc. Everything has been filled out to make it appear as if it's a real profile. The only problem being that these profiles are managed by the staff of the website. And of course you can never actually hook up with any of these women because their pictures have been used to build a fake persona. They're not .looking to hook up with anyone and most likely have absolutely no clue that their photographs are being used on FlirtContactClub.com. Section 5.2 of the terms and conditions page is where the website's administrators state that this site is for "entertainment purposes and it is explicitly not the name of the website to bring physical appointment". What does this mean? It means this website has not been created for you to meet people in a real life physical situation, it's not the goal of this website. This just this is just another telling sign proving how bogus this website is. They are basically confessing that their site isn't to bring people together, it's strictly designed to entertain you just the same as a monkey at a circus. They want you to purchase a membership so you can be entertained, never resulting in a real life physical meeting. These people know exactly what they're doing, they are calculated and they have thought of everything to deceive you while lining their own pockets with your money (if you upgrade). As with all our reviews we like to give you as much evidence as possible. We always read the terms and conditions and many times in the terms they detail and explain exactly how their whole con job works. In the case of FlirtContactClub.com they didn't let us down. In their own terms page (section 5.2) they tell us that the site is for entertainment purposes and it's not their goal to bring people together. They also tell us that they use self-created profiles. And physically hooking up with these fictitious profiles is impossible. You can read exactly what the administrator is how this website have written below or you can click on this link. This Website or Service is for adult entertainment purposes; it is not our aim to bring physical appointments/contact between members. User is aware and agrees that we may use moderated and fictive profiles for online adult entertainment purposes. Festivus Media BV expressly reserves the right to send messages to this site by self-created profiles. Physical contact with these fictive profiles is not possible. Festivus Media BV denies themselves of all liability to the extent that is allowed by the law and assumes no warranty for any kind of damage or inconvenience caused by the Service. Festivus Media BV expressly reserves the right to control conversations on the website about self-created profiles. These are fictitious profiles with which physical appointment is not possible. We've given you all the proof that we have showing you what's going on behind the curtain. With the amount of money to be made in online dating it was inevitable that shady players would try and get a piece of the pie. Some people don't care how they make money and if they have to rip you off they will. FlirtContactClub.com shouldn't be trusted, their own terms and conditions page tell us everything we need to know.